This is my Appa paati's (grandma's) elai vadam recipe. She is an expert in making it. Being in a joint family, she grinds patiently and steam cooks in hundreds without any frown. We love elai vadam and eat it fresh as soon as it is steamed and peeled. It is really hard for elders to dry them up and store for a year. The recipe is simple, but needs lot of patience. Some make it with boiled rice, some with raw rice and some use both. There is a spicy version too. But, as roasted elai vadam is good for postpartum food, my grandma does it without spice. Now, onto my grandma's special ratio elai vadam. Ajwain or cumin seeds - 2 tsp. Soak both rice together for 4 to 5 hours. Grind to a very fine paste. Add salt and mix well. Allow it to ferment for one day. Next day grind the same batter again to soft and smooth paste. Add jeera / ajwain. Dilute to thin dosa batter consistency. Grease the cut banana leaves with very little oil and keep ready. Take a greased cut banana leaf, pour a ladle of the batter and spread it thin and evenly to circles. Meanwhile, heat water in a kadai, place a plate with holes on it. 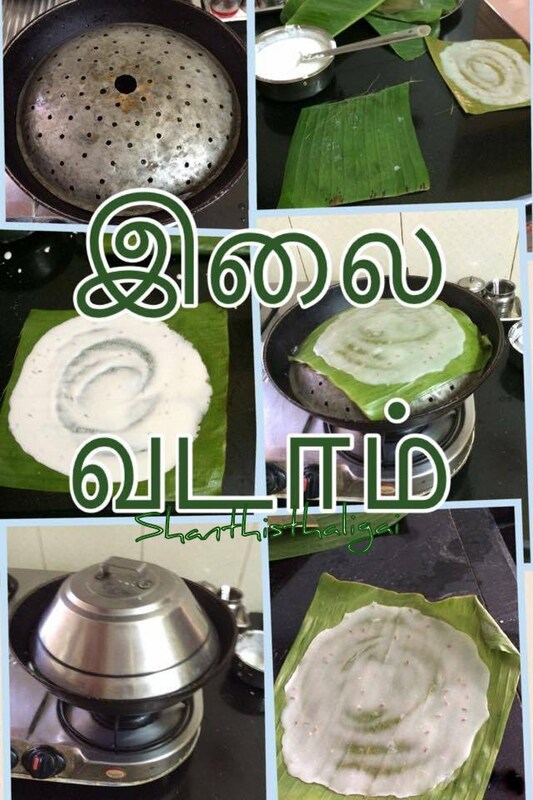 Now, place the batter spread banana leaf on top of it, cover with a lid and steam cook . Once cooked the vadam will turn glossy. It cooks in less than a minute. My patti (grandma) used to give a tip about the cooking time. She says “Onnu ezhuthara neramthaan onnu veharathukku”. It means, the time we take to spread the batter in the leaf is the time taken to steam cook one. Peel vadam gently from the leaf and eat them fresh. This can be had as an evening tiffin. 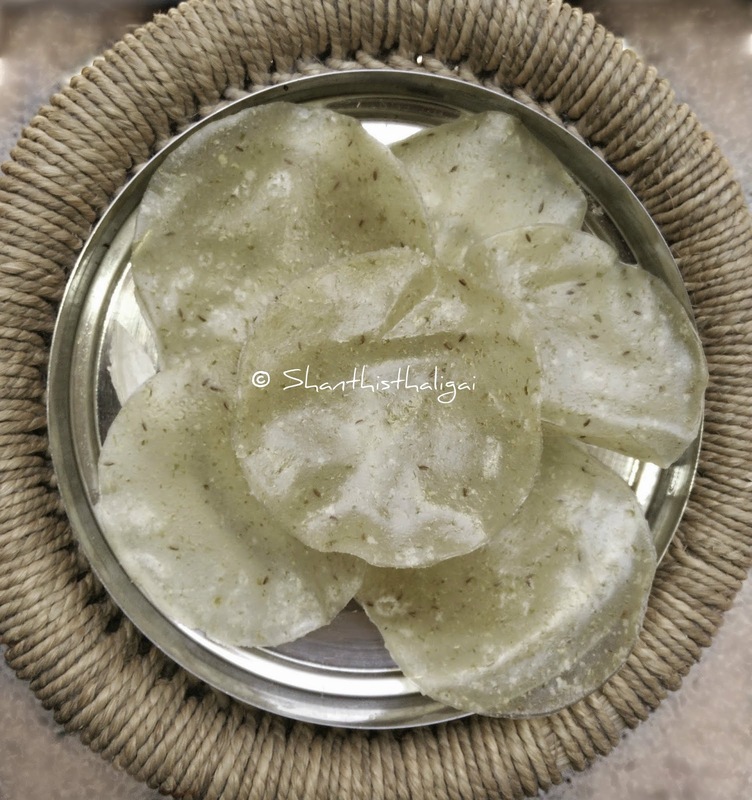 To store it, peel vadam gently from the leaf, arrange them in a clean while cloth and dry it in the shade. They dry faster as it is very thin and steamed. Stack well and store in an air-tight container. It can also be sun dried and fan dried. Roast the sun dried elai vadam on direct flame. This can be given as post-partum (after delivery) food. 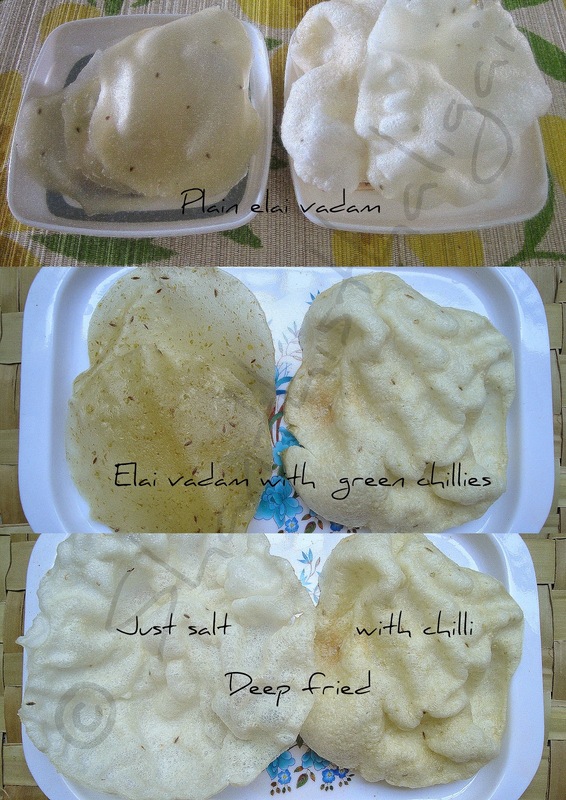 Sun-dried elai vadam can be microwaved for 30/40 seconds in medium-high. Sun dried elai vadam can be deep fried in oil. Sun dried elai vadam can be served in Delhi appalam style too (the very big appalams which we get in exhibitions). 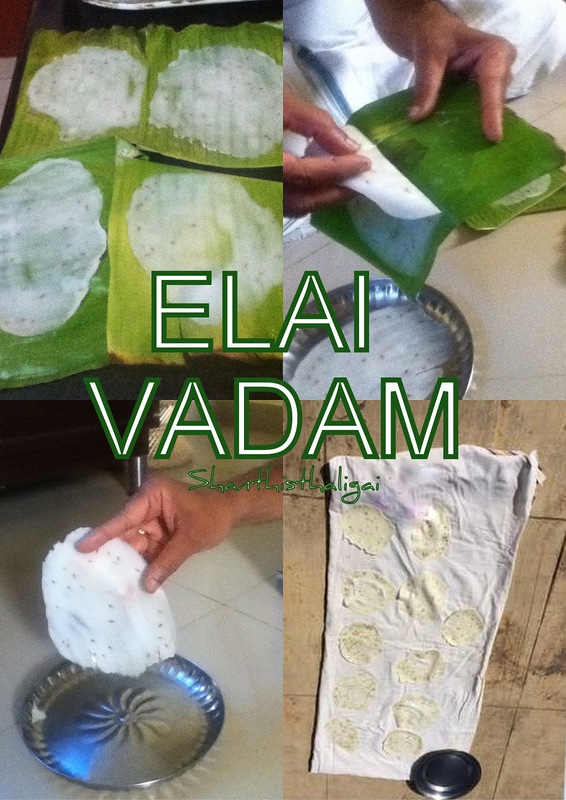 Spread some bigger sized elai vadams while making, dry and store. Deep fry in oil. Sprinkle some chilli powder and serve. Elai vadam stands are available at stores. If you are using a elai vadam stand, slightly grease the plate with oil, spread the batter and steam cook. Traditional idli pots and idli stands can also be used. For the spicy version, add 2 or 3 green chillies/red chillies while grinding. 1. Only raw rice can be used. 2. Only boiled rice can be used. 3. For the spicy version, add 2 or 3 green chillies/red chillies alongwith the above measurement while grinding. If adding chillies, the colour will not be as white as the plain. lovely big ella vadams and my hot favourite too. please courier me some. Explained in simple steps, appdiyae saapidara suvaiyO suvai. Really informative and clear. For 1 azhakku - how many vadams will i get? 4-5? If it is diluted perfect, you will get more. Wow this is exactly Thai rice paper , one can make rice paper rolls out of vadams made fresh. Amazing!